Friday, Nov. 8, 6:30-8:30 p.m. – “A Conversation with Ursula K. Le Guin.”A LIMITED NUMBER OF DAY-OF-EVENT TICKETS WILL BE AVAILABLE. Day-of-event ticketing desk opens 5:30 p.m., doors open for seating 6 p.m. Overflow seating will also be available in the EMU to watch the event streamed live. We respectfully request that there be NO VIDEO- or AUDIO-RECORDING during this event. On Friday, Nov. 8, 6:30-8:30 p.m. in the Erb Memorial Union (EMU), “A Conversation with Ursula K. Le Guin” sets the stage for feminist speculations of future worlds. 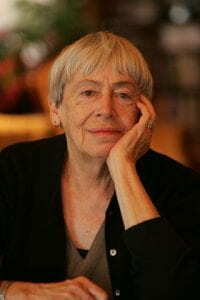 Le Guin started publishing science fiction and fantasy in the 1960s and has won the Hugo, Nebula, Locus, and World Fantasy awards, each more than once. Widely known both inside and outside the science fiction genre, some of her well-known works include The Left Hand of Darkness, The Dispossessed, The Lathe of Heaven, and The Earthsea cycle. The ticketed event will feature Le Guin reading from her work and a discussion, as well as a book signing. Moderated by Naomi Wright, Robert D. Clark Honors College student, and Michael Hames-García, Professor, Ethnic Studies, UO. The spotlight on science fiction continues Saturday, Nov. 9, 9 a.m.-6 p.m. in the EMU with the Sally Miller Gearhart “Worlds Beyond World” Symposium, featuring several major figures in the field of feminist science fiction: Vonda N. McIntyre, author of Dreamsnake, Superluminal, and The Moon and the Sun; Suzy McKee Charnas, author of Motherlines and Walk to the End of the World; Andrea Hairston, author of Redwood and Wildfire; Kate Wilhelm, who lives in Eugene and is the author of the science fiction classic Where Late the Sweet Birds Sang; L. Timmel Duchamp, author and editor with independent feminist science fiction publisher Aqueduct Press; award-winning Oregon writer Molly Gloss, author of The Hearts of Horses, Wild Life, The Dazzle of Day, and The Jump-Off Creek, and feminist science fiction scholars Grace Dillon from Portland State University, Alexis Lothian from Indiana University of Pennsylvania, Joan Haran from University of Cardiff, and Larissa Lai from University of British Columbia. Carol Stabile, director of UO’s Center for the Study of Women in Society (CSWS), said the idea for the “Worlds Beyond World” symposium grew out of two impulses. “The first was to take advantage of feminist science fiction’s ability to theorize – to rehearse – alternate universes and possible futures,” Stabile said, “to consider in very sophisticated philosophical terms what might happen or be if circumstances were different, particularly regarding gender and race.” The second impulse was “the richness of the Knight Library’s special collections in this area,” she said. Housed in the UO Knight Library’s Special Collections and University Archives are the papers of authors Ursula K. Le Guin, Joanna Russ, Kate Wilhelm, Suzette Haden Elgin, Sally Miller Gearhart, Kate Elliot, Molly Gloss, Laurie Marks, Jessica Salmonson, and Damon Knight. To help draw attention to these important collections, the “Worlds Beyond World” symposium also includes presentations of archival research projects by UO Robert D. Clark Honors College students, as well as the announcement of the first Ursula K. Le Guin Feminist Science Fiction Fellowship winner. “Worlds Beyond World” is part of a three-day 40th Anniversary Celebration of feminist research, activism, and creativity presented by CSWS, in collaboration with the Department of Women’s and Gender Studies and ASUO Women’s Center, November 7-9, 2013. Other celebration events include the documentary film premiere of Agents of Change on Nov. 7, 3-6:30 p.m., and the “Women’s Stories, Women’s Lives” symposium on Nov. 8, 9 a.m.-5 p.m.
A book signing with Ursula K. Le Guin, Molly Gloss, Kate Wilhelm, Suzy McKee Charnas, L. Timmel Duchamp, Hiromi Goto, Andrea Hairston, Larissa Lai, and Vonda N. McIntyre (Ballroom Lobby). will follow Friday’s keynote event. Tables for local women’s organizations, vendors, and sales of books authored by guest speakers will be available on Friday and Saturday. Look for related CSWS 40th Anniversary exhibits on display in the Jordan Schnitzer Museum of Art, the Knight Library and Eugene Airport. 40th Anniversary Celebration events will be held in the EMU Ballroom area and will be close captioned. Ticketing for all events is free, but registration by Oct. 23 is required for limited seating. To register, visit the Center for the Study of Women in Society website at csws.uoregon.edu or call 541-346-5015 for further information.